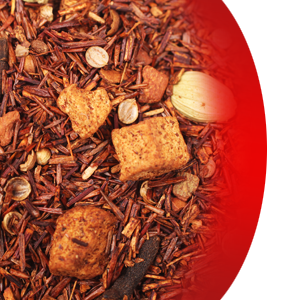 A fruity, smooth, rich and creamy rooibos tea. We are proudly presenting this very special blend, for a limited time of the year only. Enjoy rich pumpkin, blended with cinnamon, cardamom, coriander and cloves. Expand this fantastic cup of hot tea with a shot of brandy and a touch of honey, into very unique tea hot toddy. Yum! 2 oz makes 20-25 initial cups. Make sure tea isn’t too hot to drink and enjoy!